As soon as baked envelopes with paper filling gained global popularity, discussion arose immediately concerning who the idea of baking fortune-telling cookies belongs to. On one hand, Asian China and Japan claim copyright with multinational America on the other hand. We suggest that you get acquainted with the three versions and pick a winner in this "dispute" , at least for yourself. We shall probably start with the most popular version – Chinese one. In 14th century a Zhu Yuanzhang lived in the country. As his other fellow countrymen, he treated ancient national holiday of harvest day dedicated to conclusion of garden and field works with respect. Annually, in late autumn, in the day when the moon floats in the sky as a huge bowl, “public” dinners were organized in the streets of China with the principal dish being so-called moon gingerbread (small muffins with various kinds of fillings). Zhu’s life coincided with the period when the country was ruled by Mongolian, not Chinese, dynasty of Yuans. Citizens were opposing a non-indigenous emperor and making plans for a rebellion. It was quite a problem to orchestrate an unexpected mass riot without attracting authorities’ attention. But then suddenly an idea came to Yuanzhang‘s head as to the way of sending out invitations for the protest. When the harvest holiday arrived, bakers cooked traditional delight under the auspice of the inventor. Only instead of the filling there were paper stripes with information as to what, where, when and why was going to be held. Treatment was distributed among people without rising any suspicions. Riot unfolded, authorities were deposed. Zhu Yuanzhang himself soon came to emperor’s throne to launch Ming dynasty. Meanwhile cookies with notes, that had their message changed into wise sayings and wishes, became a popular national delight. 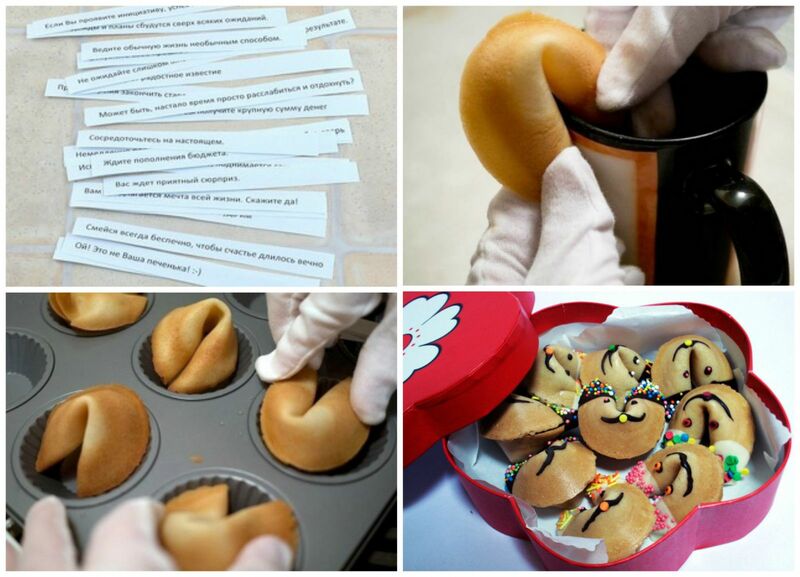 In modern China fortune cookies are produced in lots of many millions, being an important attribute of parties, buffets and a must-have component of menus in restaurants and cafes. Next version – that originated in the State of the Rising Sun – is less thrilling but probable enough. The bakery may have failed to make momentous contributions into a state’s politics but it did manage to add to culinary traditions. The Japanese are sure they invented the desert a couple of centuries prior to the Chinese. It was provided for visitors of Buddhist temples while filling-message contained phrases from religious writings. America was the last one to intervene in a dispute by suggesting as much as two versions of edible fortune-telling envelopes origins. They both say that first fortune-telling bakers were same Chinese or Japanese, not US citizens, but the territory in which the cookies were made are pinpointed within the boundaries of the USA alone. To proof the first theory there is a story of a baker David Jung who lived in California in 19th century. 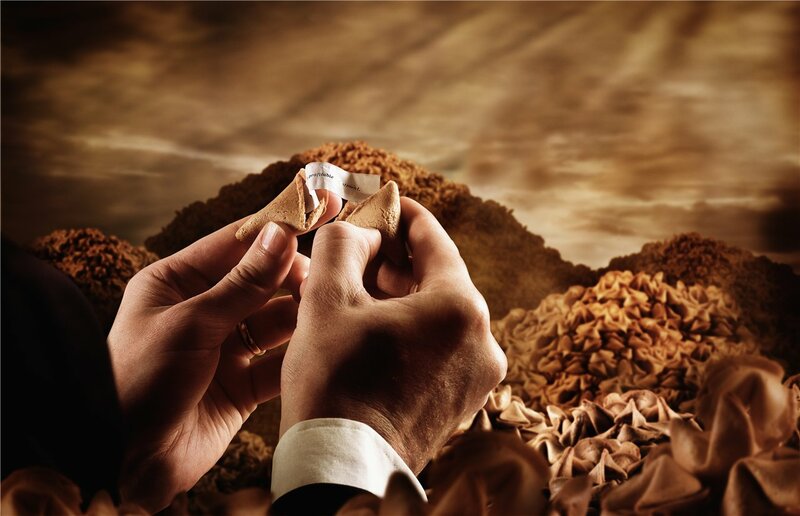 When experimenting with his signature dish, cookies with a filling, he replaced jam with notes thus giving the world the very same fortune cookies. Second, Japan-American, theory has it that the desert came to existence almost a century later. Allegedly, its author was a managing director of Japanese tea house in San Francisco Makoto Hagiwara. Afetr being fired by the mayor of the city due to his general disaffection towards Asians, Makoto took a long “leave of absence”, during which he invented serving such cookies to tea. He presented them when he managed to get reinstated in his former position. Today the treat is known almost around the globe. Cafés in different countries offer it in their menus, Internet is riddled with recipes of such patisserie and a necessary pack can be easily found on shelves in supermarkets. So, wherever the invention took place, thanks to imaginative bakers anyway! And to conclude with, here is a glimpse at the filling itself. Some may not believe in the magic of these notes, but history knows a unique instance when Englishman Danny Williams form Essex county made an abrupt fortune of as much as half a million dollars by marking numbers from the cookie in a lottery ticket he had bought the day before.